StP89 Fulda, Calais Nieulay, K.V.Gruppe Calais, K.V.A. 'C'. 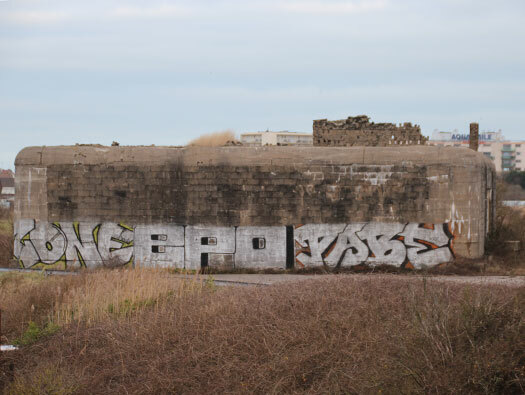 Nord Pas de Calais. 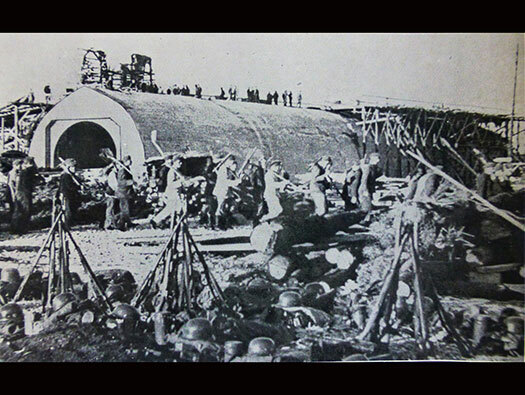 A batterie of two K5 28cm railway guns, one Dom-bunker, one SK large ammunition magazines and an air-raid shelter. In the allotments there are several AA emplacements..
2 x 28cm K5 railway guns. On the side of the Dombunker I believe are four large fans to duct out smoke from the railway engines. 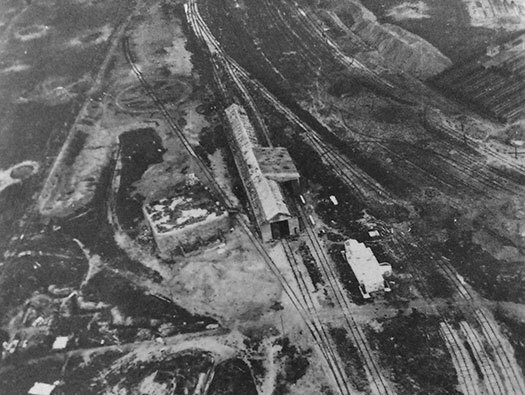 An Allied plan of the batterie site..
As we came out of the Channel Tunnel and around towards the coast, we passed StP89 Fulda on our right. There is a large parking area on the left and some allotment gardens, in here are several anti-aircraft open emplacements for 10cm AA guns. We did not photograph anything in there. 2 of at least three open emplacement 10cm le F.H.30(t) guns. This is actually a Japanese 10cm Flak, so a 10cm le F.H.30(t) guns would look like this. 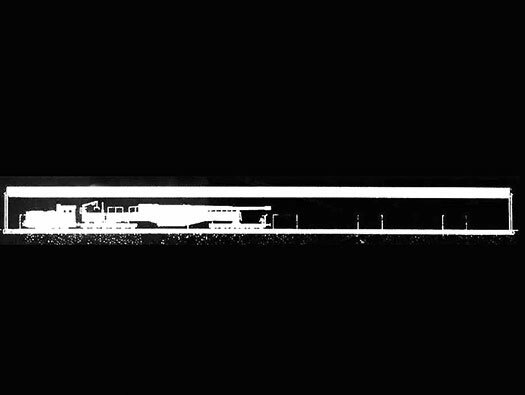 I believe two gun sets can fit into a Dombunker, one could use the turntable here and the other the one to the far left. Steam engines would be used to move the guns, but they needed time to get up steam to move. So diesel engines may have been used. OB 5cm KwK emplacement R600b. 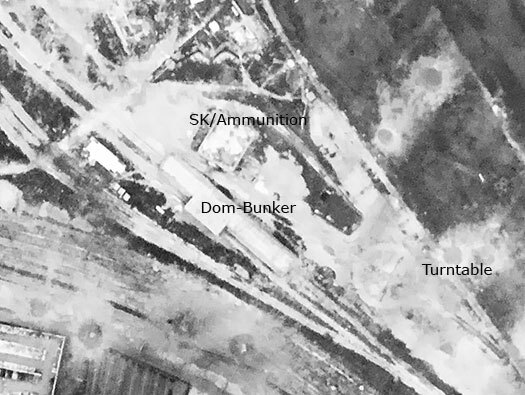 On the left the last of two SK/ammunition bunkers. 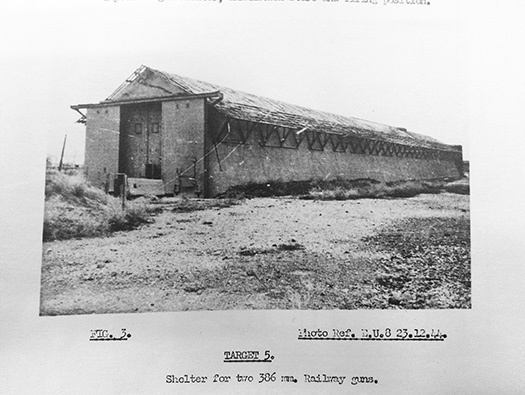 This picture taken just after its capture, showing the camouflage added to the roof to make it look more shed like..
Domebunker showing the strength of concrete to keep the guns safe from heavy bombing. Domebunker seems to have been built and now the site is being tidied up. The first lorry looks to be a French builders truck, the other looks like a Bedford OY that may have been captured in 1940. Captured Bedford OY 3ton truck. Built by OT (Todt Org.) and local builders, this is possibly a propaganda photo to show off the OT workers and how they are ready if attacked. Todt Org. builders were also soldiers as well. Firstly they have to be builders and then a Secondery role as soldiers. In Cherbourg when it was captured, a lot of OT were stuck in the town and were made to fight on the front line. K98k Â Karabiner 98 kurz 7.92mm. 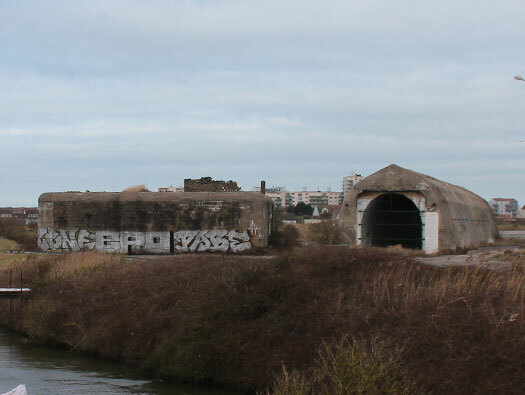 Flight Sergeant Sylvester's bombing run over Calais. 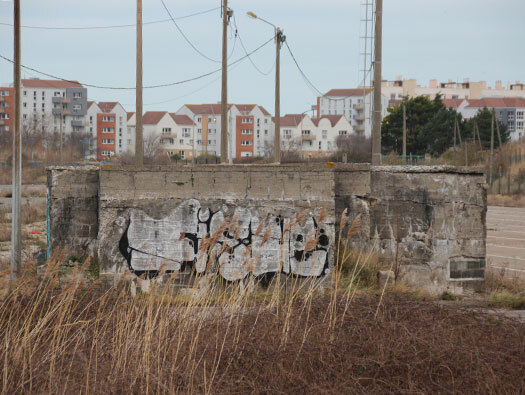 Bombing could damage the rails, turntables, etc. 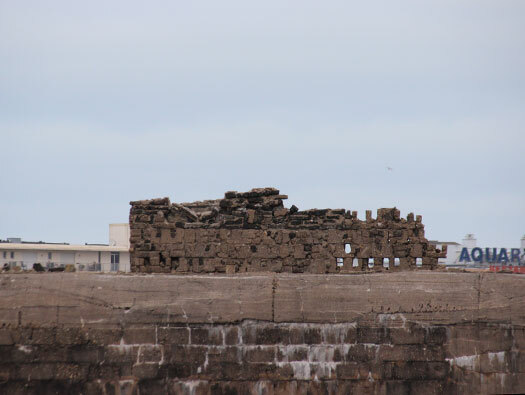 but would just chip pieces off the strong concrete roof. 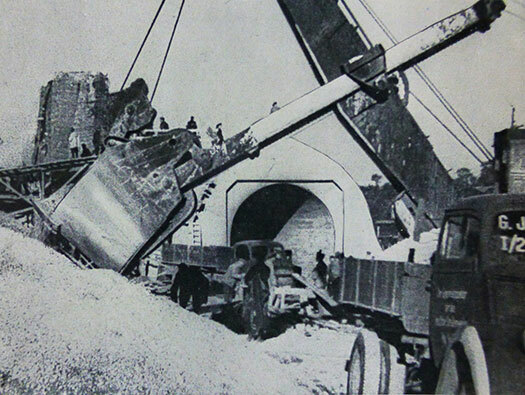 The turntables and rails were very easy to repair for the Germans as they had plenty of workers from Todt Org. and local French SNCF employees. 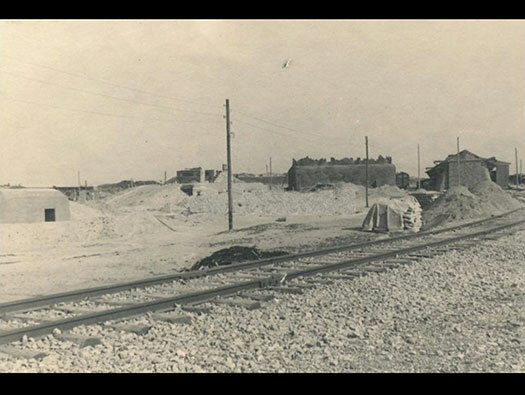 A photo taken just after the area had been captured by Allied soldiers. 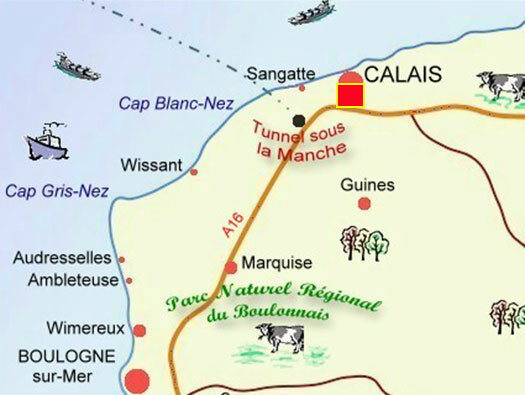 Canadian soldiers helped capture Calais. Looking straight through the Dombunker. 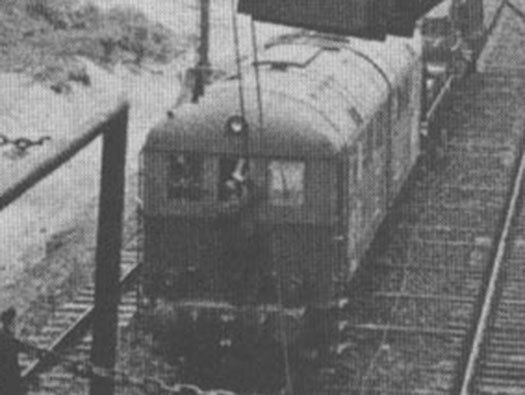 As it looked when it was being used. The doors would be heavy steel doors that could roll closed if a bombing raid was imminent. Diesel engine about to be coupled to a K5 gun. 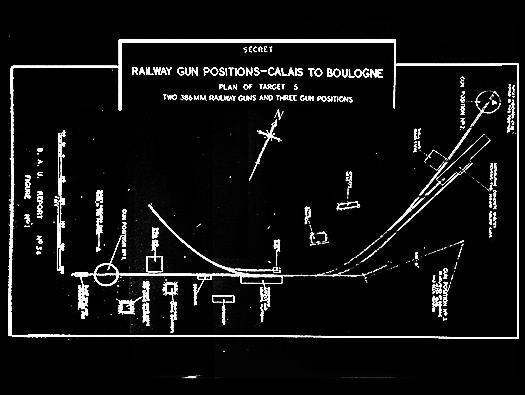 Domebunker showing the engine (diesel) and the gun in place also showing that two guns and their engines would fit in. SK/ammunition magazine one of two that were here. 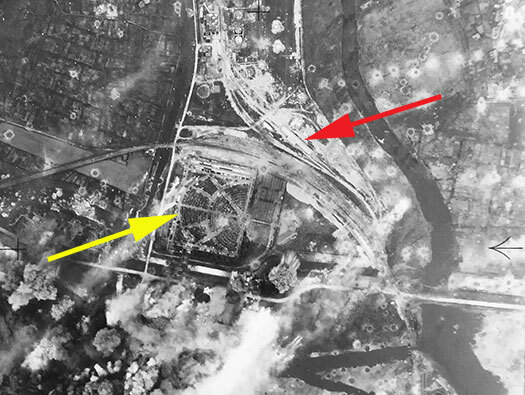 Flak on roof may have been 2cm Flak 38's. 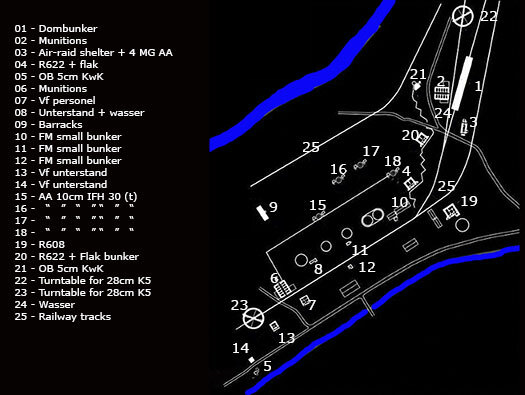 2 x open emplacement 10cm IFH 30(t) guns. This is actually a Japanese 10cm Flak, so a 10cm IFH 30(t) guns would look like this. Munitions entrance. 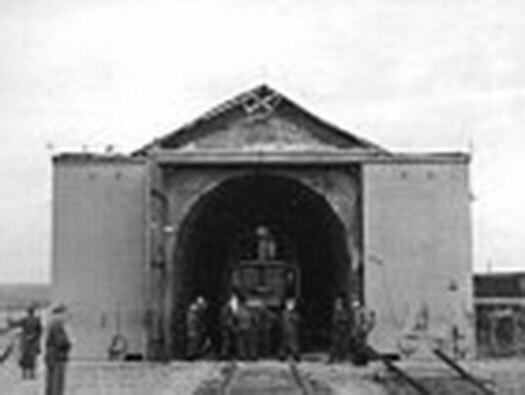 A central corridor with five ammunition stores each side, an overhead rail system conveyed the ammunition into each room. Munitions entrance railway siding. 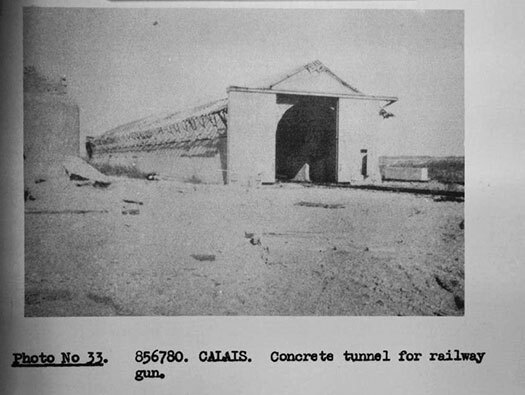 A train would pull up and unload ammunition directly into the bunker. 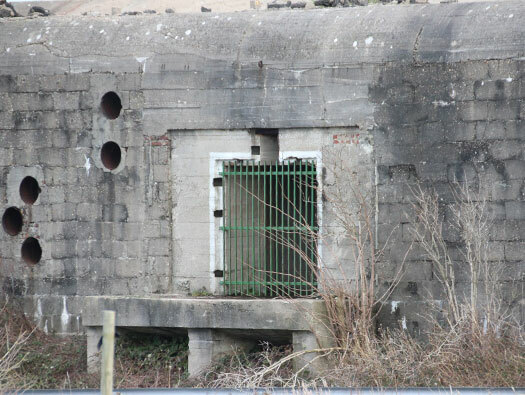 There would have been an overhead rail coming out of the door to winch up a shell/case/cordite and it could then be pushed into an ammunition room. 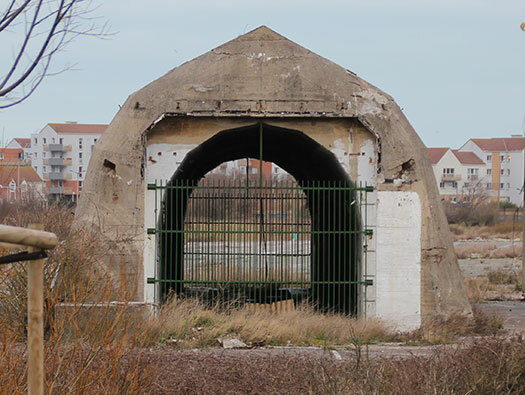 Air-raid shelter with four entrances. 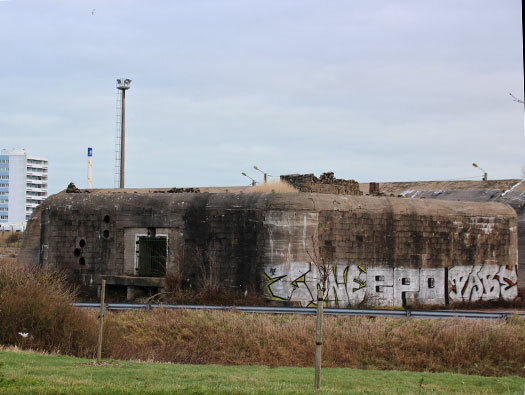 A contemporary picture of an R622 twin group personnel bunker. 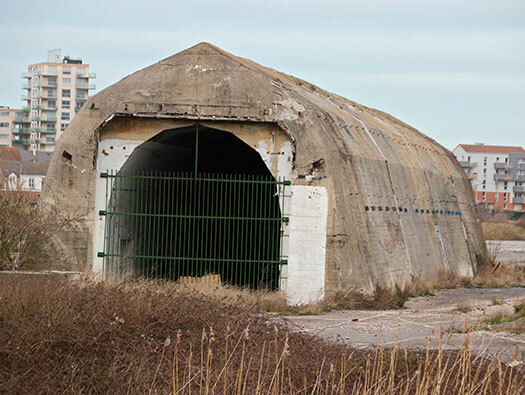 The two left doors are the entrances into the bunker and the right hand one is the Tobruk defence. R622 twin group personnel bunker..
Red arrow ---- the Dombunker. 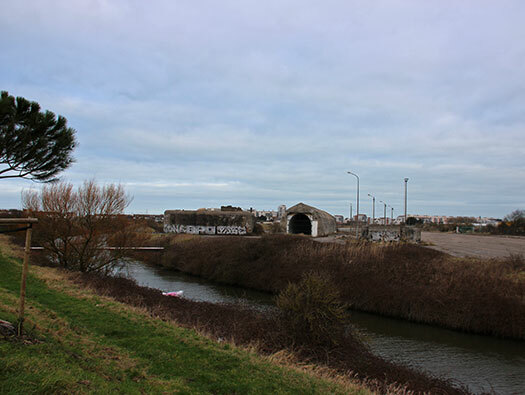 Yellow arrow - Calais cemetery. 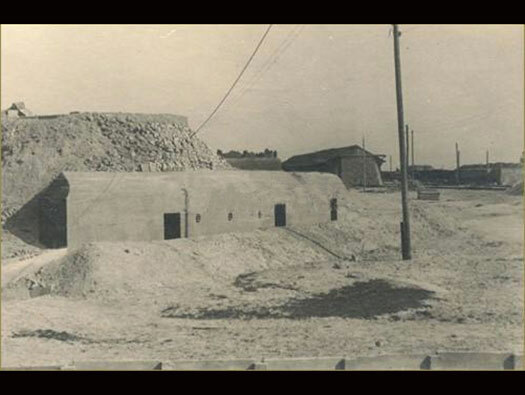 Another contemporary picture of an R622 twin group personnel bunker on the left, then a 5cm KwK L/42 open emplacement (possibly an R600b), the ammunition bunker and the Dombunker..
5cm KwK L/42 open emplacement (possibly an R600b). 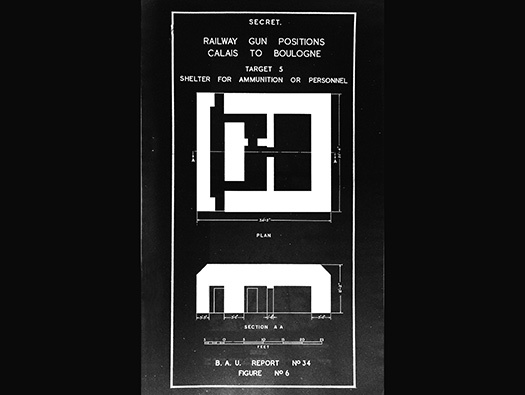 Plan of the munitions bunker. 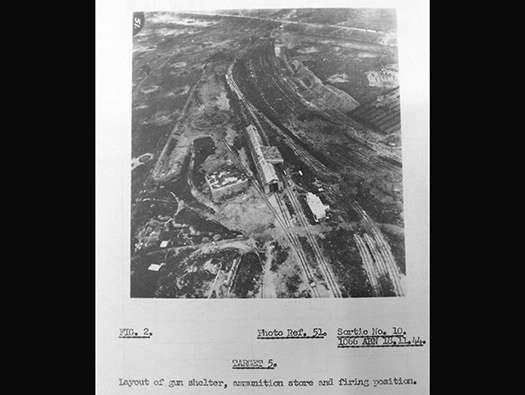 Two types of high explosive projectile were used with the K5. 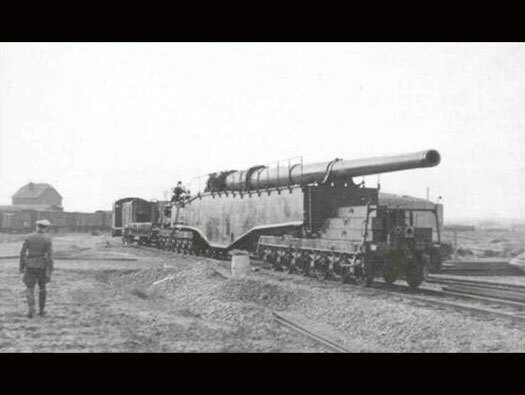 The 28cm G35 weighed 255 kilograms (562 lb) and contained a charge of 30.5 kilograms (67 lb) of TNT. The 28cm Gr.39 m. Hbgr. Z. was slightly heavier, weighing 265 kilograms (584 lb) and containing around 44.5 kilograms (98 lb) of TNT (Wiki). 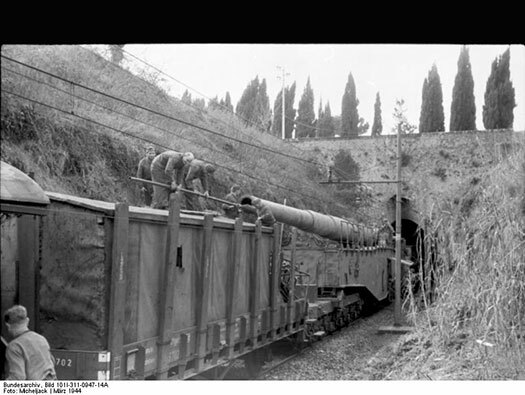 This is another way of hiding railway guns in a tunnel.